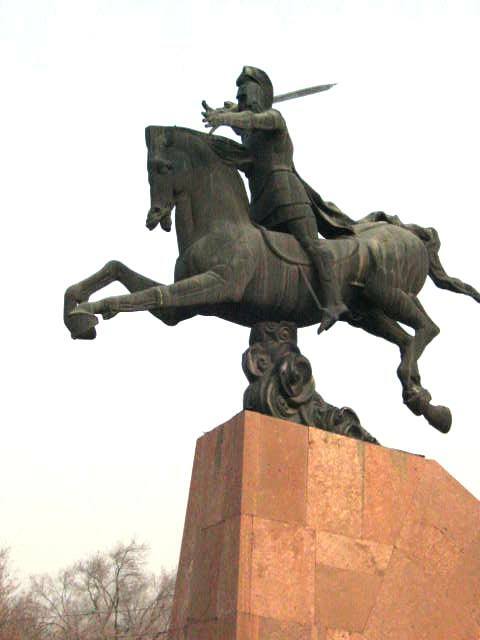 Vardan Mamikonyan was the hero and the leader of the Christian Armenian forces, who fought in the Battle of Avarayr for the faith of Christendom against the Persians who wanted an Armenian Conversion to fire worshipping of Zoroastrianism in the year 451 A.D. The Armenian army (66, 0000 thousand strong) withstood the Persian onslaught (nearly 300,000 men of infantry, cavalry and trained war elephants) in which many Armenians, including Vardan Mamikonyan himself martyred for the cause of Christianity and Religious freedom. The statue to Sparapet Vardan Mamikonyan was completed and placed in 1975 by the talented sculptor (famed for sculpture of Sasuntsi Davit) Yervand Kochar. The horseman and his steed are depicted in the moment of attacking the enemy and seem to be soaring in the air. The only point of support is the stylized cloud of dust.